Downtown Tulsa, Okla., could be described as a ghost town after the oil bust of the 1980s. [See “Back from the Dead”, March-April 2014 issue, page 22, for more background on the city’s boom to bust.] However, artists—who tend to see possibilities where others don’t—continued to make their homes and open their galleries in Tulsa’s downtown Brady Arts District. Located between the Inner Dispersal Loop, a vital highway surrounding downtown Tulsa, and the Santa Fe Railway, the Brady Arts District was established when the Brady Theater opened its doors in 1914, followed by Cain’s Ballroom in the 1920s. (Both venues still host concerts today.) In addition to these concert venues, galleries and artsy shops, some industrial businesses and a few bars and restaurants made a go of it in the district. The rest of the Brady Arts District could, at best, be defined as worn down. Recognizing a healthy downtown is fundamental to a city and its suburbs, Tulsa leaders created Vision 2025 in 2003. The one-penny, 13-year increase in the Tulsa County Sales Tax funds economic development and capital improvements. As of April 2016, total sales tax receipts exceeded $683 million. (In April 2016, Tulsa County citizens voted to extend the Vision program for another 13 years.) By partnering with visionaries from the private sector, the Brady Arts District, especially, has experienced exponential growth. Billionaire philanthropist George Kaiser is one of the visionaries who has expanded development through the George Kaiser Family Foundation while keeping the Brady Arts District’s fundamental character in place. Among the foundation’s notable projects is the Universal Ford Building, which was originally constructed in 1917 as a Model T dealership. Having worked with the George Kaiser Family Foundation on projects in the district for nine years, Chris Lilly, principal of Lilly Architects, Tulsa, was chosen to be the architect for the Universal Ford Building’s rehabilitation. The building sits on one of the last intact tracts of historic Main Street in downtown Tulsa. As such, the George Kaiser Family Foundation was focused on developing it in a way that made sense for the up-and-coming community. Lilly notes the foundation’s original intent was to turn the Universal Ford Building into multifamily units to continue introducing a mix of residential and commercial spaces to the neighborhood. But as the project moved forward, a new idea emerged for an entrepreneurial hub called 36 Degrees North, or 36°N. “The 36°N organization actually evolved with the project and Aaron Miller, who’s a program officer for the George Kaiser Family Foundation,” Lilly says. Today, 36°N is supported by the George Kaiser Family Foundation; Lobeck Taylor Family Foundation, which primarily aids entrepreneurialism; and the Tulsa Regional Chamber. The Tulsa Technology Center, University of Oklahoma and Oklahoma State University are educational supporters of the co-working space. In 2015, WalletHub, a website that describes itself as an “artificially intelligent financial advisor designed to leave your wallet full”, named Tulsa the ninth best city in the U.S. to start a business, based on data from the U.S. Census, Bureau of Labor Statistics, National Venture Capital Association and more. This isn’t the first time Tulsa has been recognized as an entrepreneurial hotbed. In fact, the city has a number of programs and groups supporting the entrepreneurial spirit, including The Forge, a startup incubator established by the Tulsa Young Professionals group and run by the Tulsa Regional Chamber; Kitchen66, an incubator for those interested in the food industry; and the Tulsa Startup Series, a bimonthly pitch competition and annual demo day led by Tulsa Community College and the Lobeck Taylor Family Foundation. However, a lot of entrepreneurs didn’t know about the re- sources available to them; therefore, it only seemed natural to create a basecamp for Tulsa’s entrepreneurs to gather, learn and motivate one another. 36°N is that place. Before its retrofit and after it was abandoned by Ford, the Universal Ford Building had been used for miscellaneous storage but basically had been vacant for the past 20 years. Fortunately, the cast-in-place concrete construction had aged well and, structurally, the building was in good shape. The majority of the 37,000-square-foot facility was wide-open space, so Lilly Architects was challenged to maintain the original, historic character of a raw, concrete building while interjecting new elements and modern uses. Lilly Architects and the building owner decided the expanse of mosaic floor, which was restored, would be the perfect location for what has become the Prairie Artisan Ales brew pub, a nice amenity for the 36°N co-workers to flesh out ideas after the workday is through. The fireplace also has been restored with an insert gas, ventless unit. “This area was basically a large volume of space that we tried to break down without dividing,” Lilly recalls. “We designed a dining ellipse on one side with a couple booths in it, which breaks up the volume that you walk through. Then there’s the bar in which we actually use a foeder, an 8-foot-wide by 9-foot-tall beer-brewing barrel, as the bar’s centerpiece. It has 20 taps coming out of it, and the bar is on a radius around that.” A larger dining space and private dining area round out the brew pub. On the second floor of the building, Lilly Architects created 23 apartments, consisting of studios and one- and two-bedroom units, many of which are for the Tulsa Artist Fellowship Program, which is a George Kaiser Family Foundation-sponsored program. It encourages artists from all over the world to come to Tulsa to live and work. Coordination among trades and an open line of communication between stakeholders served Lilly well. “We allowed decisions to evolve and change, as necessary, as the process proceeded,” he remembers. The building’s envelope was improved with new stucco and brickwork repairs. The team retained the original steel windows, which were repaired in place. “There are over 2,000 individually glazed window units that are insulated that have been put into those steel window frames,” Lilly says. Window treatments and shades protect the workspaces from glare. 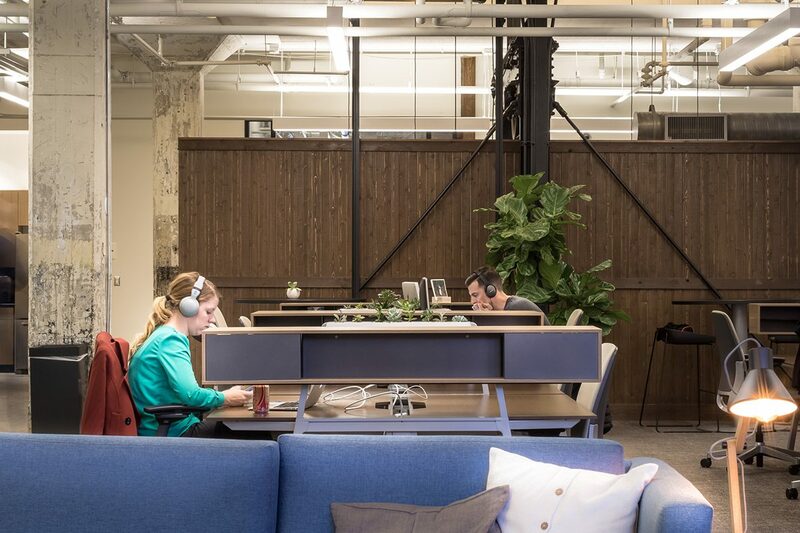 To create flexible desk space for the open-office layout of 36°N, as well as link up six conference rooms, a cable-management system was necessary that didn’t require trenching or drilling into the 100-year-old concrete structure. In-carpet wireways were installed throughout the open-office workspace and conference rooms. The wireways provide workers access to power, audiovisual and data connections. As 36°N continues to grow and evolve, the ADA-compliant cabling easily can be reconfigured. The George Kaiser Family Foundation and Lilly Architects also were rehabilitating the Fox Building, which was built in 1906 and is the Brady Arts District’s oldest building, during the Universal Ford Building’s retrofit. Consequently, the team created one chilled- and hot-water central plant to heat and cool both buildings. Now, the Universal Ford Building is reinvented for another generation of economic engines. Architect: Lilly Architects, Tulsa, Okla.